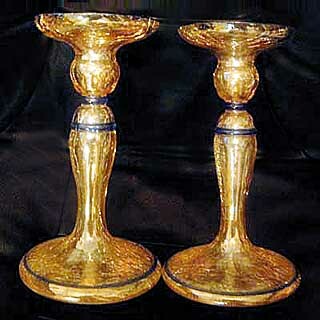 These candlesticks are 8 3/4-inches tall and have blue bands around the marigold trunk which has a crackle effect. They are hollow. I have never seen any at auction. These are from a private collection. A 10-inch marigold set of candlesticks listed as Blue Banded sold at auction in 2016 for $10. They appeared to differ in details from the examples shown here.